After our first encounter with the European pepper moth (EPM) in San Diego County and the ensuing quarantine actions nationwide, the interest and intensity of the regulatory action has subsided. However, there have been new reports of serious damage on new hosts, specifically in the ornamental plant industry across the country. Therefore, it makes sense to review what has been learned, the research on this pest that is in progress and the need to be vigilant. Background. EPM, Duponchelia fovealis Zeller, can be a very serious pest to agricultural crops and in ornamental plant production. The caterpillars easily avoid detection by feeding near the base of plants below the soil line; sometimes they burrow into the stems causing complete collapse of the damaged plant. The moth originates in the Mediterranean area where it is a significant pest of agricultural crops including peppers, squash, tomatoes, corn, etc. ; it has entered the United States and Canada on ornamental plants and fruit. EPM was found on begonia in the San Marcos area of San Diego County back in 2004 and again on other hosts in April and July of 2010. Current detection maps indicate that the moth is now widely distributed in San Diego County from south Chula Vista to the Riverside County border, with heavy concentrations in the Vista/San Marcos areas. In addition, it has now been detected in 22 other counties in California and in 17 other states. Current Research. The goals of our research efforts in San Diego County are to allow growers to more effectively manage EPM, eliminate pest spread and minimize the potential for economic losses through crop destruction. We have a colony of this pest and active research projects at the Center for Applied Horticultural Research in Vista. Determining efficacy of registered and unregistered products, including biorationals. Evaluation of biological control agents. Developing a best management practice (BMP) based on LBAM. Determining the biology of the insect at constant temperatures to develop degree day models. Testing of host plants and identifying the types of damage observed. Many of these objectives have been reached and presentation of the information is in progress. Brief findings. A BMP has been established and is being revised as new research warrants (Bethke and Vander Mey 2012). Much of the information collected was used to create a Pest Management Guideline for EPM, which will be available shortly. Keep checking the UC IPM Pest Management Guidelines for Floriculture and Nurseries web page (http://www.ipm.ucdavis.edu/PMG/selectnewpest.floriculture.html). Table 1. Temperature and average days for total development of European pepper moth (EPM). One of our most recent research findings includes the development of EPM at constant temperatures. 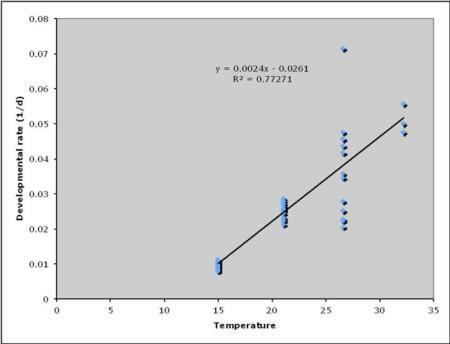 Preliminary data shows that the warmer it is, the faster the pest develops (table 1), as you would expect.  A predictive model is presented in fig. 1 that represents the development time for EPM at any selected temperature. Dr. Rebeccah Waterworth, Department of Entomology at UC Riverside, analyzed the data, which will be used to develop a degree-day model. Fig. 1. Temperature development over time (1 over the number of days of development, 1/d, left axis) of EPM at selected constant temperatures in degrees centigrade (lower axis). Each point on the graph represents a single individual insect. The line and equation in the figure represents a potential predictive development model. Recent reports. A new detection with a new state record was observed in Maryland recently (Gill 2013). Gill reported that EPM was observed in June 2013 on zonal geraniums in Maryland. Gill identified the EPM boring into the stems at the soil line and causing significant damage. A new state detection has also been reported in Georgia. In May of 2012, Cooper (2012), a news editor with the University of Georgia College of Agricultural and Environmental Sciences, noted that EPM had caused significant damage to lantana at a local greenhouse production facility. Additionally, a colleague recently admitted to me that she found EPM damaging Christmas cactus in New York. Lastly, here in San Diego County, a local grower with a serious infestation in a mother block of poinsettia contacted us. We already knew that EPM was damaging potted poinsettias during the fall season, but to find it on an established planting is worrisome. In addition, we have seen significant damage to potted rosemary (fig. 2). Clearly, the host list and damage list for ornamental plant production is growing. Fig. 2. 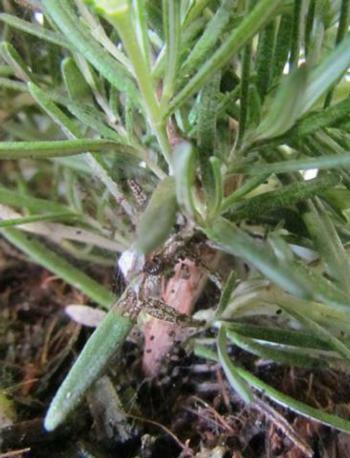 EPM larva established on the lower leaves of rosemary. Photo by Bryan Vander Mey. Monitoring. It will be important to monitor for this pest especially if there are susceptible host plants. In many cases in ornamental plant production, the mere presence of the pest will require preventative treatment applications to prevent damage and movement of the pest. Detection can also be used to coordinate biological and chemical control measures. Water traps have been used quite successfully in San Diego County. These methods require the use of a pheromone, which is now readily available from sources in Canada, the Netherlands and the United States. Management. The most effective products so far have been acephate and Bt. Preventative applications of Bt have been successful in protecting poinsettias in the early stages of production. Other products known to be effective against worms (caterpillars) may be effective against EPM, but this insect is very difficult to contact with insecticides because of its behavior. As with other moth species, treating the insect in the early instar stages is the most effective. Bethke JA,Vander Mey B. 2012. European pepper moth: A new invasive moth threatens California agriculture. UCNFA News. http://ucanr.edu/sites/UCNFAnews/Feature_Stories/European_Pepper_Moth__A_New_Invasive_Moth_Threatens_California_Agriculture/. Cooper D. 2012. Unwelcome guest: The European pepper moth arrives in Georgia. Growing Georgia. http://growinggeorgia.com/features/2012/05/unwelcome-guest-european-pepper-moth-arrives-georgia/. Gill, S. 2013. European pepper moth found in Maryland greenhouses. Greenhouse Management. http://www.greenhousemanagementonline.com/European-pepper-moth-found-in-Maryland-greenhouses.aspx.